I wore the multiwrap dress in navy it’s such a lovely alternative to black. As with all the multiwraps you can wear it to suit your body so I wore it wrapped into the body at the front to narrow the straps a bit and then twisted round to come down the middle of my back. You don’t have to, but I couldn’t resist having a split in the skirt which just gives an added dimension if you’re wearing for a special occasion. You can’t even see it when you’re standing still but it makes for a good photo opportunity and a lovely addition when you walk! Not only can you wear the multiwrap dress again in a different way, it also means you can chop and change your accessories complementing the dress or contrasting with bold colours as I chose to. I didn’t adjust it once all night and as long as you’re careful to make sure the lining is against your skin I wasn’t irritated or scratched by the sequins at all. 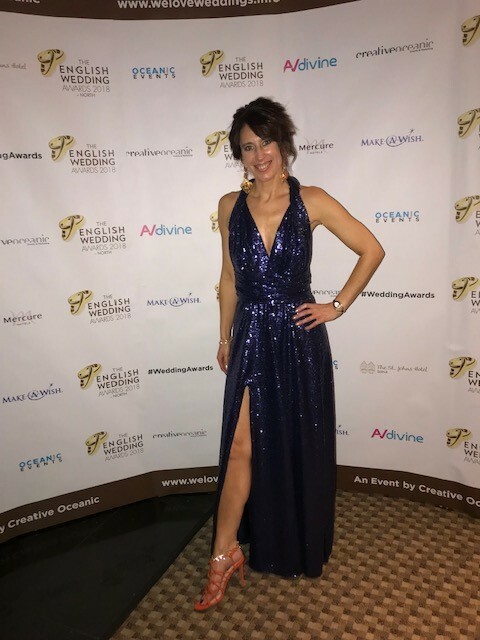 The sequin multiwrap dress is available in lots of colours and if you’re wanting something special to wear for a Christmas ‘do’ then we can currently get you all the following colours in time: the navy (like mine), dark platinum (like chain mail! ), red wine (sooooo Christmassy), rose champagne (so ‘now’), rosey posey (a lovely matt rose gold) or the champagne (very special). Calling all brides! You may want to have your bridesmaids in some special sequins especially the rose champagne and rosey posey. Or you may even want something to change into yourselves in the evening or for another part of your celebrations – we’ll be seeing the clear sequins one soon which looks fab! Here’s the rosey posey multiwrap dress which I couldn’t resist just trying on when I unpacked my sample! It’s not my size or as you can see not been taken up on the hem so it’s far too long, but you get the idea. This is a lovely colour, especially if you want something different to shiny sequins. And because it made us laugh, here are the outtakes – I’m not that great at this serious posing malarkey! All in all, a great dress for those special occasions. Give me a call now if you’re interested in coming to try on!